The British Embassy in Algeria is in the capital city of Algiers. 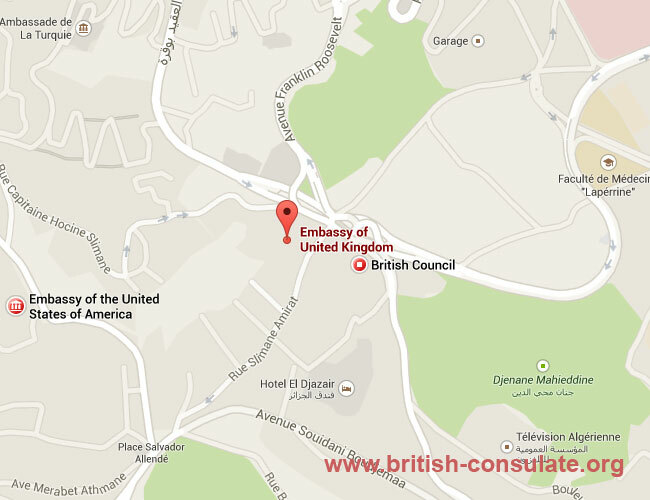 We have listed the telephone numbers, street address and also a map for the are around the British Embassy. Note that this British Embassy is closed on Fridays and Saturdays however they do operate on Sundays. Algeria is a Muslim country so their customs are not the same as in the West. The Embassy can issue a British Passport for British nationals in Algeria, register a British national born abroad or issue a UK Visa. see the Travel Advice for Algeria on this website for more information about the country. All visa applications for the UK has to be made in person when done in Algeria. This needs to be done at 71, rue Mohamed Belkacemi 1er etage immeuble Ericsson El Madania (Oued kniss). This is where you can apply for a family visa, visitors visa or a work visa for the Untied Kingdom. most of the visa work they have given over to WorldBridge for online processing of visas. Contact your family if in hospital or detained. These are holidays on which the British Embassy in Algeria is closed. These are a mixture of British holidays and also Algerian holidays. Call the embassy before you arrive to ensure that they are open. The national day of Algeria is on the 5th July each year. Note that the embassy is closed also over normal British Christian holidays such as Good Friday, Easter Monday, and over the Christmas period in December. Note that the visa application and processing times in Algeria normally takes in the range of 4 weeks to 8 weeks so if you are booking a ticket and making arrangements to visit the UK then ensure that yoiu take the visa process time into consideration. Ensure that you always apply as early as possible.